Dior shows the beauty of a woman ultimately, and one of the most representative is my favorite roses. There will be a bunch of roses in my room everyday, and every girl should bloom her youth just like the rose does! When the gorgeous rose and elegant Dior come to your mind, do you still remember the rose & Dior printed sweatshirt of ROMWE? The classic blend of Rose and Dior is advocated by the public unanimously. This blend continues to be embodied on the t-shirt and phone case according to the customer. 3D roses pattern is printed on the main part of the t-shirt, representing that every girl is a rose. "Dior" is printed on the front, but they are not Dior. They are Rose D, seen on the top of the "i"--a beautiful woman head, which means confidence, beauty, brave and passion. Crew neck makes this t-shirt easier to wear and more sporty! Girls with short hair will be more youthful and energetic; while long-haired girls will be more charming! The bright color will help you to stand out among the crowd and catch people's attention. Now!! 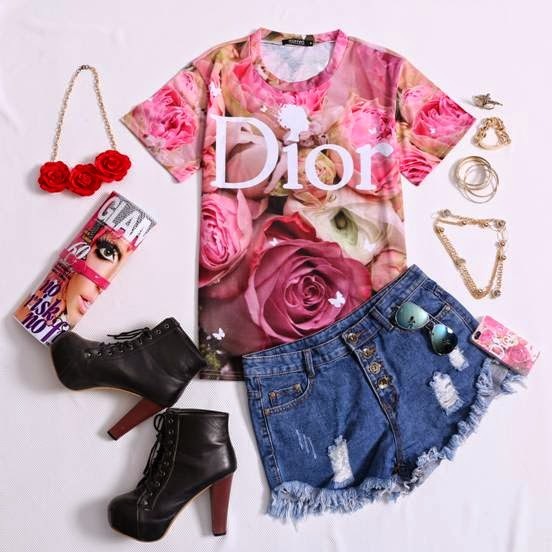 Romwe has a surprise for you.. "The Dior & Roses Print T-shirt" will be sold at the price of $9.99, up to 60% off. Not only that, they also have a special gift for you!! The special gift is an Iphone5/5s case with Dior&Rose Printed. 100 lucky customers can get it! $9.99 is an affordable price, but not everyone can get it! Starts on 1am 22nd May GMT, lasts only 24 hours! not satisfied with the sweatshirt. Free shipping worldwide!